Apt. 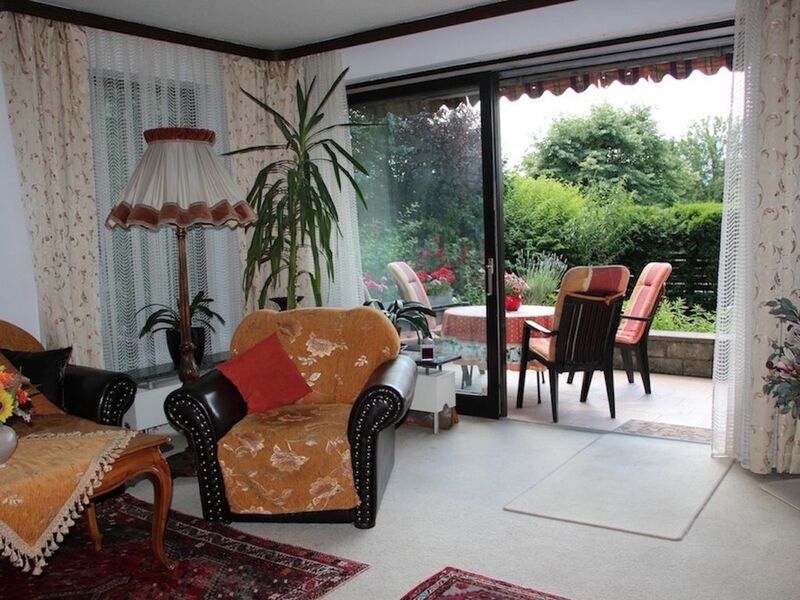 Wienerwald: bright, cosy and quiet 2 room apartment, partly sloping roof, in the 2nd floor, facing the garden and with a beautiful park view 50 sqm, sleeps 2 - 5 people comfortably. Non smoking-apartment. Bedroom: with one double bed and one single bed, radio, Living/ dining area with a table seats 5 people, a comfortable lounge area which can be converted easily into 2 beds, easy chair, SAT-TV, radio, CD player, books, pamphlets of Vienna, kitchenette with a 2-burner electric stove, refrigerator, mini-oven, dishwasher, microwave, coffee machine, tee kettle and toaster oven, bathroom with shower and toilet (hair dryer). We provide towels, bed sheets and table lines, which will be changed weekly during your stay! Welcome at our privat guest-house 'Am Wiesengrund'. We offer 3 complete equipped apartments for 2 - 6 persons in our family managed house in the Western part of Vienna. Quietly and safe situated with best traffic connections. Within 30 minutes you get to the city center and all sights of Vienna. Very well located for sightseeing but also ideal for recreation beyond the bustling city life. Free parking in front of the house. Departure until 11am. We kindly ask our guests not to smoke in the apartments in respect to the following guests! We had a wonderful time in Ilse and Otto's beautiful apartment. It was clean, comfortable and convenient. We really enjoyed getting to stay in a neighborhood convenient to the center of the Vienna. They gave us all of the tips we needed to get to Vienna and were absolutely wonderful hosts. We would definitely stay there again. We were two middle-aged American couples for 12 days for Christmas in Vienna, and were completely satisfied in every way with our stay at am Wiesengund. The large, comfortable, clean, homey apartment was as represented in the photos, and we appreciated all the attention to detail, from Christmas decorations, to maps, to coffee filters and seasonings in the kitchen cabinets. The beds and bedding were excellent; the dining room a real plus for staying in for dinner; the bathrooms ample and up-to-date; plenty of comfortable seating in the living room; and the kitchen with everything one could need. The Beueherts were helpful in every way, from getting us reservations at restaurants to recommending Austrian wines. Transportation to Vienna was easy with buses every 10 minutes (and bus stops only 150 meters away) to the U-bahn station at Hutteldorf, which took us into the city's heart in another 10 minutes. Perfect location, especially if someone travel with dog(s). Just opposite the apartment wonderful field and forest for a walk - super! kurzaufenthalt war alles nötige vorhanden. Beschreibung des Apartments war ehrlich, gemütlich eingerichtet, vor allem fanden wir alle, in einer Küche benötigten Dinge.Super! Gastgeber gaben uns viele Informationen un Tipps - ein netter persönlicher Kontakt! In a perimeter of 200-400 m you will find restaurants (traditional Viennese, excellent Japanese, Pizza), grocery stores, supermarkets, bakeries. 2 km away is the 'Auhof' shopping center where you will find more than 90 stores (H&M, electronic stores, also post office, pharmacy, hairdresser an a large movie theatre, fitness center, bowling, pool/billard and a disco. Also nearby are outdoor and indoor swimming-pools, tennis courts, crazy golf as well as a short ski run with T-bar lift and floodlight. Our location is ideal for taking walks in the woods or in the meadow across from the Pension. Ideal also if you are a jogger, Nordic walker or mountain biker. Nearby places of interest: Schoenbrunn Palace, Zoo (oldest zoo in Europe, petting zoo), Otto Wagner\'s art nouveau villa of the painter Ernst Fuch (Museum); Laudon Palace(walking distance, Vienna's only water castle), the baroque pilgrimage church 'Mariabrunn' (17th century) and the Vienna Stadthalle. Golf: Several golf courts can be reached in and around Vienna within 10 to 30 km. In unseren Preisen sind Betriebskosten und Endreinigung inbegriffen. Handtücher, Bett- und Tischwäsche werden von uns zur Verfügung gestellt. Kinderermäßigung bis 12 Jahre. Keine Gebühren für Kinder unter 3 Jahren. Kinderbett und Hochstuhl auf Wunsch vorhanden Für Ihren H U N D, der bei uns auch immer willkommen ist, berechnen wir EUR 4,00 pro Tag.